This crimping tool used for assembling crimp type servo connectors. 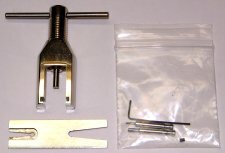 This tool is used for removing ball links from the ball. Works good and has a good price. Set contains all of the attachments to remove pinions from both large and small motors. Set contains all of the popular sizes 1.5, 2, 2.5 and 3mm. Great for tightening and loosening. This screwdriver features the patented ProHold� ball-ends. Fits 2mm socket head screws. The ProHold� ball-ends are one of the newest additions to the Bondhus line of tools. This screwdriver features the patented ProHold� ball-ends. Fits 2.5mm socket head screws. This screwdriver features the patented ProHold� ball-ends. Fits 3.0mm socket head screws. This screwdriver features the patented ProHold� ball-ends. Fits 4mm socket head screws.